It’s fair to say we’ve both learned a lot doing this bathroom. I’ll save the lessons learned for a post soon and for now let’s get cracking with the finished article. Our budget for the small bathroom was £2K so with a new bath, basin, loo, towel rail and tiles to buy there wasn’t much left in the pot to pay for labour. In November James took a couple of days off either side of a weekend to break the back of the work. Turns out six days is not nearly long enough when you’re a one-man band with a willing yet not particularly helpful wife. We’ve grabbed several hours here and there over evenings and weekends and four months later it’s just about finished. Positioned the new suite and worked out where any new plumbing would be required. We only needed to adjust the pipes for the sink and the towel radiator. As we were changing to a floating sink the pipes had to relocated into the wall along with a strong wooden frame to support the basin. The sink and radiator were test fitted to ensure their positioning was correct. Next came the floor prep. James screwed down any loose floorboards and then added ‘No More Ply‘- a thin water resistant backer board to provide a solid surface for the tiles. Then on to tiling the floor with the Hexagon Floor Tiling (on mesh sheets) using flexible tile adhesive and flexible grout in a light grey finish. Then we constructed what became known as the ‘poo pipe’ A super glamorous name for boxing in the toilet foul waste pipe and added a ledge over the box for display. This was rebuilt due to the dimensions of the new toilet. Next we fitting the skirting boards over the floor tiles. It’s personal preference but I wasn’t keen on the two different types of tiles meeting so I was keen to reinstall the skirting. Then it was time to tile the walls. We used 15×15 gloss square tiles from Walls and Floors. I had originally wanted a matt finish but this meant having to sacrifice the brilliance of the white, so instead we went for a gloss finish. Then it was time to paint the walls with a couple of coats of Dulux Super Matt White, and the skirting boards and door with Farrow and Ball Manor House Grey Estate Eggshell. We decided to keep the door frame white and so that was painted with standard satinwood brilliant white. In went the basin (which looks ginormous here due to the angle of the shots! ), the radiator, the bath and then the toilet. The shower is still to be fitted. From a faffing perspective, we hung the mirror on french vintage hooks I found on Etsy and then added another few hooks to the back of the door. The pink hammam towel was bought when we were on holiday in Turkey a few years ago. The little round straw bag which is great for storage was from Yonder. The small round shelf was the last one in the Urban Outfitter sale and the two little shelves over the heated towel rail were constructed using offcuts. The mirrored tray on the loo is a perfume tray I bought years ago from a shop in Sheffield. I had custom mounts made for the BigJon Hotel Print and the cheeky minx of a lady getting undressed from Juniqe. They’re framed in thin frames which are just from The Range. Every single job took far longer than anticipated but we got there in the end. I’ve tried to mention where I bought most of the bits and pieces from but just shout if there’s anything you’d like to get your hands on that isn’t referenced. This looks lovely Lauren. 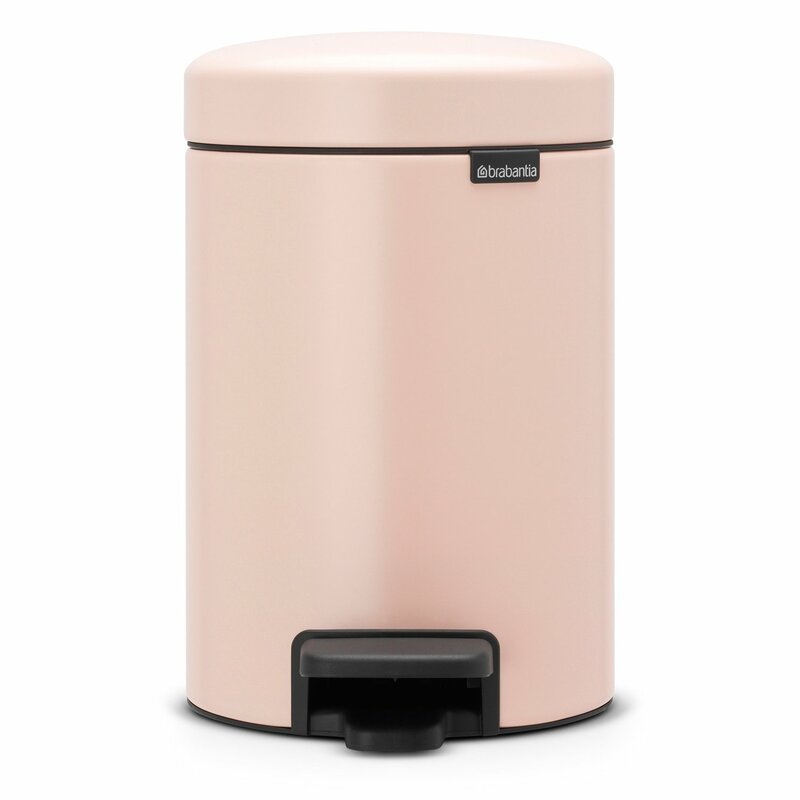 Apologies if I missed it, but where did you buy your little pink bin please? Thanks Emma. I’ve added it to the shopping widget thing at the end of the post. It’s really cute and the perfect size too. Thank you, it’s the perfect shade! I wrote a comment and then my phone lost signal so it’s gone. This, for £2k is chuffing amazing. We’ve just been quoted £10k to move a downstairs bathroom where there is already some plumbing available. We almost died. How easy is it to remove radiators and toilets and sinks? And taking off skirting boards? Could we do this ourselves easily and then have the professionals in to do the tricky jobs? And what about putting skirting back on? How do you get the join? The problem with our house is that, as I said Monday, it’s had so many bad DIY jobs that I want to sort them out – we are literally peeling back badly painted layers to get a clean finish. I don’t want to compound the problem of crap DIY. Some rooms we are doing ourselves. On that, does anyone have the name of a product that I can use to smooth out old picture hooks? And where I’m taking out badly fitting blinds? It probably only took about half a day to remove the old suite. The old bath was free standing too so just James just shut off the taps, removed the pipe connection and unscrewed the waste from below. For the toilet the water was switched off and disconnected, then the waste pipe slid out (keep a plastic bag and elastic band on standby to cover the pipe to stop the whiffs). It’s really satisfying clearing a room and if you can save some money then go for it. Skirting boards came off easily with a hammer and chisel – we numbered them on the back and reinstalled them in the same place so he joins were in the same place but also caulked down the join for a smoother finish. I did a post on storage a while ago – http://rockmystyle.co.uk/how-much-storage-do-you-need-in-a-bathroom/. Basically I went through everything I owned and threw out heaps of stuff so all I needed in here was the basket for my make-up and a few other bits and pieces. We do have another shower room though with a medium sized unit in it which you can see here – http://rockmystyle.co.uk/what-to-do-with-a-stair-bulkhead/ for the rest of the stuff. Oh the shower is a very cheap electric one that was in place before which we’re just going to reinstall. Not glam at all! Looks so lovely! Apologies if I’ve just missed it but where is the lidded basket from? Thanks Amy, it was from HomeSense. I bought it in December but they had lots of different versions and sizes so hopefully it”s still in stock. The tiles are just amazing. I love this bathroom. We’re in desperate need of a bathroom makeover – this looks great! Where did you get your bath? We’re just about to start our bathroom renovation now and I’m completely overwhelmed by the options. Any tips? Where did you get your shelves from?